The Paradyn project develops technology that aids tool and application developers in their pursuit of high-performance, scalable, parallel and distributed software. The primary project, Paradyn, leverages a technique called dynamic instrumentation to efficiently obtain performance profiles of unmodified executables. This dynamic binary instrumentation technology is independently available to researchers via the Dyninst API. Other research by the Paradyn project includes dynamic instrumentation of running operating system kernels, the Kerninst project, and the development of middleware for scalable, efficient, robust applications in the MRNet multicast/reduction network.  The 12th Annual Scalable Tools Workshop will be held at Solitude, Utah, July 8-12, 2018. Registration is now open; don't delay!  May 2017: Dyninst 9.3.2 has been released.  The 11th Annual Scalable Tools Workshop was be held at Lake Tahoe, July 31-August 4, 2017.  December 2016: Dyninst 9.3 has been released.  The 10th Annual Scalable Tools Workshop was held at Lake Tahoe, July 31-August 4, 2016.  June 2016: Dyninst 9.2 has been released.  December 2015: Dyninst 9.1 has been released.  MRNet 5.0.1 has been released.  The 9th Annual Scalable Tools Workshop was held at Lake Tahoe, August 3-6, 2015. 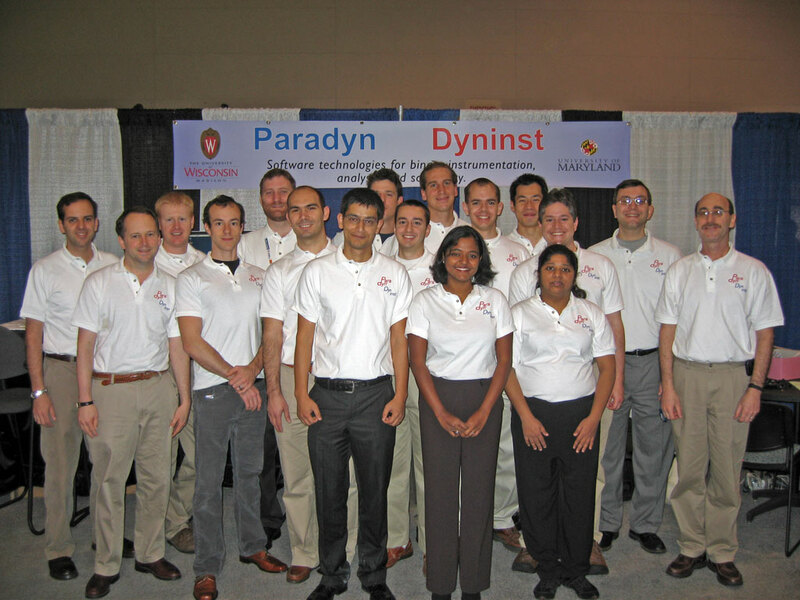  The Paradyn/Dyninst Annual Meeting was held in Madison, April 29 - May 3, 2013, at the Wisconsin Institutes for Discovery.  Posters from SC12 are now available.  The 2012 Paradyn/Dyninst Annual Meeting was held March 26-28, 2012 on the University of Maryland campus.  The Paradyn/Dyninst Annual Meeting was held in Madison May 2-3, 2011, in the beautiful new Wisconsin Institutes for Discovery building.  The Paradyn group had a great research exhibit at the SC2009 Conference. See our group photo from the conference.  On generating adversarial binaries for misleading authorship identification: "Adversarial Binaries for Authorship Identification" by Meng and Miller, Under Submission.  On the impacts of compilation toolchains on identifying multiple authors in binary programs: "Binary Code Multi-Author Identification in Multi-Toolchain Scenarios" by Meng and Miller, Under Submission.  On spatial data reduction techniques at extreme scale: "Data Reduction and Partitioning in an Extreme Scale GPU-Based Clustering Algorithm" by Welton and Miller, 2nd International Workshop on Data Reduction for Big Scientific Data (DRBSD-2) , Denver, CO, November 2017.  On determining multiple program authors in binary program: "Identifying Multiple Authors in a Binary Program" by Meng, Miller and Jun, 22nd European Symposium on Research in Computer Security (ESORICS), Oslo, Norway, September 2017.  On evaluating whole application performance of a GPU algorithm at extreme scale: "The Anatomy of Mr. Scan: A Dissection of Performance of an Extreme Scale GPU-Based Clustering Algorithm" by Welton, Miller, Workshop on Latest Advances in Scalable Algorithms for Large-Scale Systems (ScalA '14), New Orleans, LA, November 2014.  On detecting code reuse attacks: "Detecting Code Reuse Attacks with a Model of Conformant Program Execution" by Jacobson, Bernat, Williams, and Miller, International Symposium on Engineering Secure Software and Systems (ESSoS), Munich, Germany, February 2014.  On utilizing GPGPUs in a Tree-Based Overlay Network for data analysis: "Mr. Scan: Extreme Scale Density-Based Clustering using a Tree-Based Network of GPGPU Nodes" by Welton, Samanas, Miller, Supercomputing 2013 (SC2013), Denver, CO, November 2013.  On line level source code authorship: "Mining Software Repositories for Accurate Authorship" by Meng, Miller, Williams, and Bernat, 29th IEEE International Conference on Software Maintenance (ICSM), Eindhoven, Netherlands, September 2013.  On detecting code reuse attacks: "Poster Abstract: Detecting Code Reuse Attacks with a Model of Conformant Program Execution" by Jacobson, Bernat, Williams, and Miller, Research in Attacks, Intrusions and Defenses (RAID), St. Lucia, October 2013.  On editing binaries by transforming their CFG: "Structured Binary Editing with a CFG Transformation Algebra" by Bernat and Miller, Working Conference on Reverse Engineering (WCRE), Kingston, Ontario, Canada, October 2012.  On prevalent obfuscations used by malware: "Binary Code Obfuscations in Prevalent Packer Tools" by Roundy and Miller, ACM Computing Surveys.  On providing library function information for stripped binaries: "Labeling Library Functions In Stripped Binaries" by Jacobson, Rosenblum, and Miller, ACM SIGPLAN-SIGSOFT workshop on Program Analysis for Software Tools and Engineering (PASTE), Szeged, Hungary, September 2011.  On graph transformation-based binary instrumentation: "Anywhere, Any Time Binary Instrumentation" by Bernat and Miller, ACM SIGPLAN-SIGSOFT workshop on Program Analysis for Software Tools and Engineering (PASTE), Szeged, Hungary, September 2011.  On determining the authors of program binaries: "Who Wrote This Code? Identifying the Authors of Program Binaries" by Rosenblum, Zhu, and Miller, European Symposium on Research in Computer Security (ESORICS), Leuven, Belgium, September 2011.  On inferring the source language and toolchain details from binary code characteristics: "Recovering the Toolchain Provenance of Binary Code" by Rosenblum, Miller, and Zhu, International Symposium on Software Testing and Analysis (ISSTA), Toronto, Canada, July 2011.  On using binary analysis to make instrumentation more efficient and effective against tamper-resistant programs: "Efficient, Sensitivity Resistant Binary Instrumentation" by Bernat, Roundy, and Miller, International Symposium on Software Testing and Analysis (ISSTA), Toronto, Canada, July 2011.  On scalable composition of a single-system image name space from thousands of independent file servers for use in building scalable tools and middleware: "FINAL: Flexible and Scalable Composition of File System Name Spaces" by Brim, Miller, and Zandy, International Workshop on Runtime and Operating Systems for Supercomputers 2011 (ROSS'11), Tucson, Arizona, May 2011.  On analyzing and instrumenting binaries that are obfuscated, packed, and self-modifying: "Hybrid Analysis and Control of Malware Binaries" by Roundy and Miller, Recent Advances in Intrusion Detection (RAID), Ottawa, Canada. September 2010.  On using MRNet on Cray XT platforms: MRNet: A Scalable Infrastructure for the Development of Parallel Tools and Applications by Brim, DeRose, Miller, Olichandran, and Roth, Cray User Group, Edinburgh, Scotland. May 2010.  On a new, lightweight library for MRNet: A Lightweight Library for Building Scalable Tools" by Jacobson, Brim, and Miller, Para 2010: State of the Art in Scientific and Parallel Computing, Reykjavik, Iceland. June 2010.  On determining the source compiler from binary code: "Extracting Compiler Provenance from Program Binaries" by Rosenblum, Miller, and Zhu, ACM SIGPLAN-SIGSOFT workshop on Program Analysis for Software Tools and Engineering (PASTE), Toronto, Canada. June 2010.